One thing that I notice about my friends, if not all Filipinas, is not they all love to color their hair! And I do, too! Hair is our crowning glory and we would surely look more beautiful and radiant when our hair is enhanced with hair color that matches our skin tone. 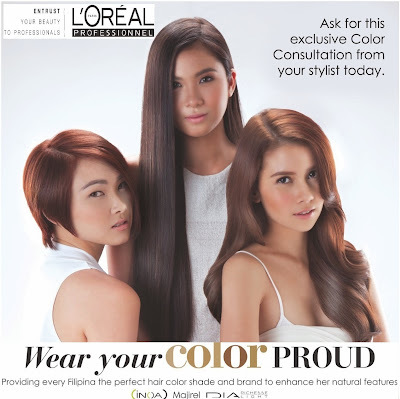 That's why it has become L'Oreal Professional's advocacy to be able to provide all Filipinas the best hair color using the right hair color brand for us and they want to do this through proper consultation and diagnosis. It is their aim to be able to educate hairstylists on the science of proper skin tone diagnosis to give all types of Filipinas - Mestiza, Morana or Chinita- the hair clor that suits us best! 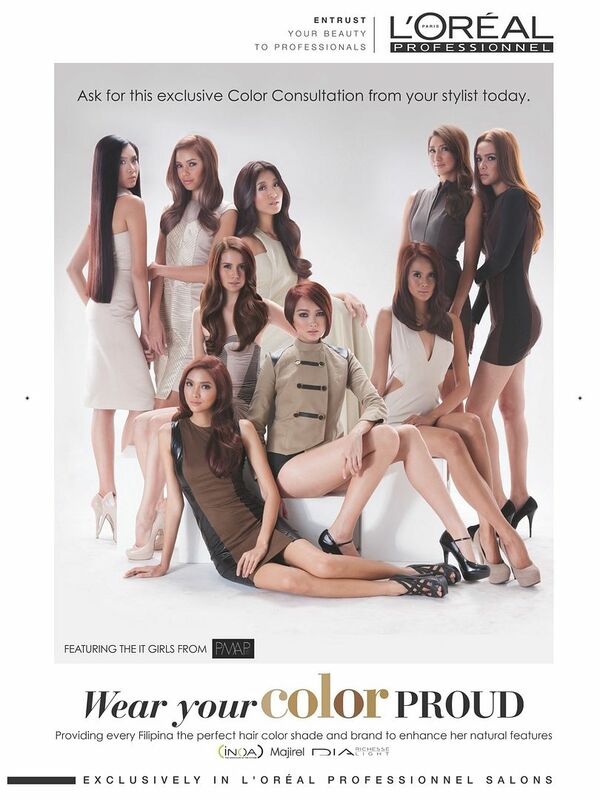 They have launched they Wear Your Color Proud Campaign to bring back proper consultation and diagnosis in the salon. The campaign targets to create a discussion between the hairstylists and their clients on what color would go best with any Filipina skin tone. This will also make the client feel more comfortable over her decision, giving her a boost of confidence and satisfaction! To make the event even more awesome, Loreal will give 1 LUCKY READER will get a chance to get the hair color that will suit her skin tone best! And what's more? You get to go to the salon WITH ME! Yay! Like a mini makeover / meet up day!! Meaning the 2 OF US will go to the salon together to get a hair color makeover! This will be available in partner salons of L'oreal Professional : bench Fix Salon, Bang's, Tony and Jackey, Henri Calayag Salon, Philippe Tordjman Le Salon, and Regine's. 3. Regram or Repost this photo on Facebok, Instagram or Twitter with the caption "I wanna be part of the 9,000 Filipinas to Wear Their Color Proud!" 5. Comment below and leave your name, email address, Facebook, Twitter and Instagram accounts.